I got my copy of the new Kill Team game today and I'm excited to put together a kill team for the game. I'm going to re-brand my Eldar corsairs kill team for Shadow War: Armageddon for Kill Team. The rules for an Asuryani kill team give a bit more variety than the Shadow War version, allowing storm guardians (including the option to turn a storm guardian into a gunner!). I'm able to use even more of my old 1st and 2nd edition Space Elves/Eldar miniatures, though some of the weapon options (power glaive!) will require either chopping up an old Jain Zar (I have at least three, so that might not be a bad option) or using the plastic/resin ones from either the new dire avengers or Yriel. I know who my fusion gunner is going to be, though. I'm a bit disappointed that warlocks, easily my favorite of the Asuryani units, aren't an option. These battle psykers often lead guardian squads into battle; and with both the Grey Knights and Thousand Sons having psykers (and GW implying that other factions will have access to psykers in later expansions), it just seems odd that warlocks were left out of the initial release. I'll get over it (especially if GW gives them to us later). One of the things I really like about the Asuryani options is that you can opt for an all dire avenger kill team, all guardians (including pure defender or pure storm, if you please), all rangers, or a mix of these. Also, your leader could be anybody - you're not limited to a dire avenger exarch as you were in Shadow War: Armageddon. Some of the more exotic items that were found in Shadow War: Armageddon aren't anywhere to be seen in Kill Team. At least, I haven't seen them yet. I'm talking about things like red-dot laser sights, clip harnesses, etc. The "customization" is mostly limited to what you can expect to find in the kit for the model type chosen, so it's basically similar to WH40K 8th edition. The real customization is in the overall composition of your kill team, the specialties chosen, etc. Lore fanatics will enjoy the charts of Asuryani names. I'm interesting in hearing others' thoughts on the Asuryani in kill team, as well as seeing your Asuryani kill teams. I really don't get why an Eldar Killteam would include Guardians. It's a surgical strike so heavy weapons shouldn't be a concern. For any kind of elite strike team, wouldn't you think aspect warriors with years of training and no other purpose in life (or the part thereof where they walk the path of the warrior) than fighting would be preferable? Especially Striking Scorpions and Warpspiders... yeah there's Avengers (and i like those a lot) but all the other choices legal for Killteam so far are CIVILIANS with guns. Why, GW? Get your own fluff straight gawdammit. /rant. I could see the Striking Scorpions and Howling Banshees, but the exclusion on jump infantry and bikes rules out Warp Spiders, Swooping Hawks (which would be perfect for my not-eldar-corsairs), and Shining Spears. I don't really see the Fire Dragons or Dark Reapers as anything but support (something like special operatives in SWA or hired guns in Necromunda), especially in the sneaky sneaky (sort of) behind enemy lines missions that the core rulebook is about. Maybe later expansions will add some of these as they become relevant to the types of missions that are covered (e.g., if there is ever a bike-oriented expansion, we might see both Shining Spears and windriders). I don't see guardians as "just" civilians, though. In most craftworlds, guardians will make up the bulk of the forces available to an autarch (Iyanden, Biel-Tan, and Saim-Hann being the exceptions). Guardians often bring skills from their normal paths, whether those they currently follow or paths they have previously trod (many will have followed the path of the warrior in one or more shrines previously). In some cases, guardians might be the only individuals that an autarch can spare for a kill team (whether through lack of more suitable aspect warriors in a force, or because the aspect warriors are engaged in other missions). The units available largely make sense (to me), with the exception of warlocks and Striking Scorpions. Getting back to my kill team, I like that the roster (up to 20 models!) allows me to have a wide range of models available to choose from. I'm thinking of developing it so that I have sufficient models for a pure-anything team (e.g., enough Dire Avengers for a pure Dire Avengers kill team, and enough rangers for a pure rangers kill team) or I can mix and match for a more balanced (?) kill team. I'd never thought I'd do this, beging a staunch chaos worshipping heretek, but I'm actually thinking of an eldar kill team modeled as a Corsair crew. Rounded out with a bit of everything, and true to my nature, heavily converted out of unexpected models or expensive characters. 100 points exactly, feels well rounded out and should be quite fun to model. The penalty for shooting a weapon at more than half range seems like it will really negatively impact the accuracy of shuriken catapults. I feel like the only reason to take Guardian Defenders is if you want to bring a heavy weapon platform. Only the other hand, having a couple of Storm Guardians with flamers seems like it could be all sorts of fun. Edited by TURBULENCE, 12 August 2018 - 11:27 PM. The Defender Leader, Comm Spec with launcher and the Sniper hang back, everything else moves up, shurikening, burning and if need be chopping. It’s something others have noticed in other-army KT discussions (CSM, Orks,...quite a few others), that having your leader as a the-most-killy-model actually hurts the team as you can’t give them a specialisation that compliments the way you want to use them (: out there killing). As we can only have one Exarch, who can be really shooty or (as far as the Craftworld list goes) really choppy, it’s best to give him/her a Spec for that. Let a poet/potter/gardener be the leader (and in my list, a backup heavy weapon gunner ). Just to answer why warlocks arent in KT yet... Warhammer community (FAQ document on the KT release) answered that by saying they were only including units that have plastic kits already plus a few units that under fluff couldnt really be ignored (ala Rangers). I was all ready to play Eldar until I saw gaurdians instead of Aspect warriors. Guardians can do just fine, but I was looking forward to a Kill Team of Aspect Warriors. Pretty good but that is a lot of points spare. I would be tempted to drop the AML down to a Starcannon and then you can buy a whole extra Guardian Defender and still come in at 99 points. i was searching the forum for other advices and this thread was the first thing to pop up. I am looking into creating a kill -team using an autrach as a commander for a 150 pts game. What are some good ideas in terms of having models that should be an auto include in a kill team against MEQ? I see mostly MEQ players in my area. I want a sort of good plan before i start buying more miniatures i would not use. Edited by Mechanicus_Adept, 29 October 2018 - 05:07 AM. A heavy weapon platform with Starcannon would be a good start. A couple of Storm Guardian gunners with fusion guns would also help. Other than that, you will have to rely on your shuriken catapults and hope that weight of fire will get the job done. so using dire avengers is not really necessary? 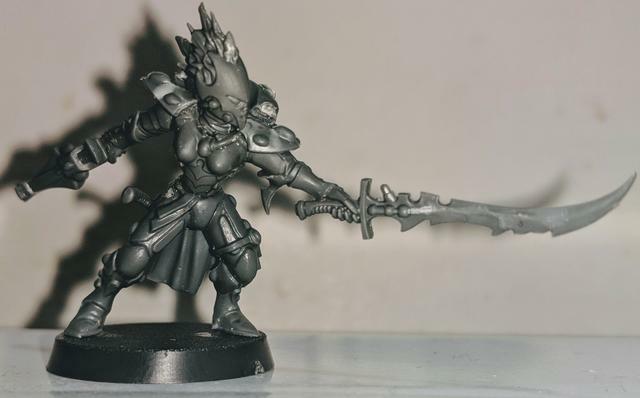 I recently bought the Kill Team: Commanders expansion and was pleased to see the Asuryani options including the warlocks. i recently bought the commander's book as well. i have a painted autarch that i am iching to have a go in a game. Commanders help focus your army more as you build your kill team around the commander's ability. No, that is not what I meant to imply. Sorry for not being clearer. You can only take a single heavy weapon and a couple of special weapons. I was advising that these should be ones with good armour-busting capability rather than options like Shurican Cannon and Flamers which are better against less armoured opponents. You will need regular infantry too and a Ranger or two for covering fire is always helpful. I lean towards Dire Avengers over Guardian Defenders for the better range and armour but quality vs quantity is very much a personal choice. Blazing Greetings everyone around here! I plan on building a Craftworld Kill-Team, too, and came around here to see how people play them. There's one thing I stumbled upon: Why there's only one Ranger is most lists I see here? Fun game when played against people new to the game. Edited by Mechanicus_Adept, 10 November 2018 - 02:45 PM. After re-thinking things with the revelation (!) that my Leader doesn’t have to be a Dire Avenger Exarch, and making further adjustments to include some Commander options, here is my revised Asuryani command roster. It’s an Eldar Corsairs kill team, but is heavily composed of Craftworlders (I’m not going to bother you with the lore right now – you can see basic lore and planned color scheme here). I wanted to include alternatives, so there’s an expensive Commander option (the autarch) and an inexpensive Commander option (the warlock), and similar choices for other areas. Kill teams will generally be based around Dire Avengers, with one of the Exarchs and three or four Dire Avengers. The composition of the rest of the team will depend upon the opponent. The example kill team, highlighted in purple, comes out to 100 points. I can probably swap out the ranger with another Dire Avenger for a 99 point kill team. At this point, though, I’m less concerned with kill team composition and more concerned with getting the command roster right. The choice of a ranger as my alternate leader was driven by the mini. It’s just a really cool older mini. If I replace that fighter, I have a storm guardian defender with a power sword (i.e., Aeldari blade). He’s in the appropriate pointing stance for a leader. The only gain I see there is a reduction in points for a leader. If my leader is going to hang back and help the shooters, though, I prefer that the fighter have sufficiently ranged shooting attacks, so I’ve gone with the ranger for now. I’m open to persuasion, though, if there are compelling arguments. Are there any areas that you think I can improve upon? list looks good, but it depends on your playstyle. remember that having less points than your opponents allows you to have more command points and can pull off more eldar shenigans. @Ioldanach, how has your experience been playing KT with asuryani? Out of curiosity for those who have played KT with asuryani. I am looking for advice on how to build it so that i do not get wiped out too fast. Edited by Mechanicus_Adept, 07 January 2019 - 02:42 AM. I'm embarrassed to admit that I haven't actually gotten around to playing them. I refuse to play with unpainted models and my models are sitting on the desk awaiting my attentions. I've been distracted with developing homegrown rules for a true Anhrathe kill team, and a couple of models might be left as-is instead of being converted. Asuryani have trouble against nurgle with their high toughness in my experience. If you are using command rosters, including fusion funs will be nice.